Call of Duty: Zombies Game for iPhone, iPad and iPod Touch. Call of Duty doesn’t really need much of an introduction, however Call of Duty: World at War: Zombies (probably the worst game name in recent years?) is their first venture onto the iPhone and iPod touch. Bringing such a brand name game to the iPhone is great for the iPhone’s credibility and Activision delivered all the way with this game. 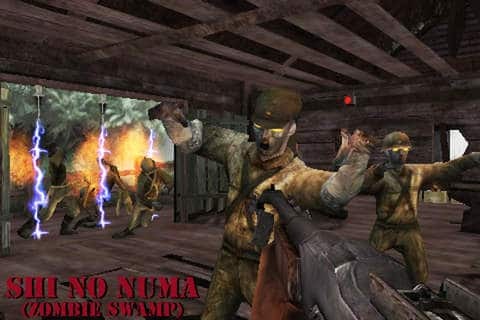 Call of Duty: Zombies on the PC and consoles had a special game mode that could be unlocked after beating the game allowing you and your buddies the chance to fight off droves of Nazi zombies (the scariest type of Zombies) in a constant onslaught of zombie shooting fun. The popularity of the zombie mode probably overshadows most of the single player (and multiplayer) aspects of the console and PC version sadly for the developer. World at War wasn’t well reviewed and the most talked about feature was the zombie attack. So building off the popularity of the best aspect of the console version comes Call of Duty: Zombies. The Call of Duty: Zombies game version 1.50 is simply that, you are locked in a room with tons of zombies attacking you from every which direction. You have grenades, knife, and a tommy gun and an assortment of weapons to fight off your neck biting foe. At a $1.99 price point, the game is on the top end of the App Store spectrum, but the reviews are showing that the price may be worth it, as the game is getting stellar reviews so far and it looks to potentially be one of the best produced games on the platform. Grab this great game for your iphone, ipad or ipod touch from iTunes Apps store here.